Emergency Preparedness - Page 70 of 70 - A survival kit is not something you figure out when an emergency happens. I rarely ever recommend folks to go out and buy the latest and greatest gadgets for survival preps. However, this is one piece of equipment I feel is worth the price. A radio scanner, sometimes called a police scanner, allows you to listen in on radio traffic (police, fire, rescue squad, etc.) in your area. As long as you don’t modify them so as to hear cordless phones or other prohibited conversations, they are quite legal to own and use. You can find them at any decent quality electronics store, such as Radio Shack. I don’t recommend buying one at a big box discount retailer, such as Walmart, unless you know exactly what to look for in a unit. Be prepared to spend upwards of $100.00 to get a decent one. You want something that has an AC adapter to plug in at home, as well as being able to run on batteries or a DC plug for your vehicle. Further, get a portable one (handheld) rather than a base unit. I’ll explain why shortly. The idea here is to perhaps get some degree of warning with regards to emergency situations. Radio traffic concerning roadblocks, for example, would allow you to plan a different route out of town if you’re trying to evacuate the area. These scanners are programmable. Odds are good they’ll try to sell you the latest edition of the book that lists all the different radio frequencies. Don’t bother as this information is free online. My particular unit has 10 “banks” of 40 channels each. A bank is nothing more than just a group of frequencies. I can set it up to scan one bank, all of them, or any combination thereof. You want to program in all the emergency services frequencies in your area. Keep those all in the first few banks of your scanner. Then, program in State and Federal agency frequencies as they may apply to your area and concerns. Now, here’s why you want a portable unit. If you anticipate having to travel any distance to get to your emergency retreat location, program the last few banks with the emergency services frequencies for the areas you’ll likely travel through between home and your retreat. Doing so will perhaps allow you a “heads up” as you approach those areas. This is an ongoing feature of this blog. Every Wednesday, I’ll present to you a different scenario. You take the information given and run with it. Give some thought as to what you’d do and how you’d go about it. I understand there will be scenarios that just wouldn’t apply to you personally for whatever reason. Feel free to change it around a bit to suit your own situation. Please share your thoughts in the comments. It is the middle of December and you’re out doing some Christmas shopping. Just as you enter your local big box discount retailer (Target, Walmart, whatever), your cell phone rings. A trusted contact, someone in your immediate survival group, tells you he has reliable information that the balloon is going up in a matter of hours. The news of this hasn’t hit mainstream media yet and probably won’t for at least the next hour. You have time to do one last shopping spree at this store. As luck would have it, since you came prepared to buy Christmas presents, you have about $400.00 cash in your pocket. What do you buy? What gaps might you have right now in your preps? I’m not referring to the wise idea of having layers of clothing in cold weather. Instead, I’m talking about having access to multiple emergency kits of varying size and degrees of complexity. I feel it is important to have options in an emergency, and backups for your backups. While each emergency kit should cover the basic essentials as best as possible, the kits should also augment each other. Your first line of defense, so to speak, would be what you have in your pockets. In a future blog post, I’ll show you how to put together an exceedingly small survival kit that will fit in a shirt pocket. For now, you can Google “Altoids tin survival kit” and see something along those lines. At the minimum, try to always have a way to light a fire (cheap butane lighter if nothing else), a decent blade (pocketknife or multi-tool), and clothing that is season appropriate. If you have those things with you at all times, you’re a step ahead of many people already. The next layer is a bug out bag (BOB). Again, we’ll delve more fully into this topic later. In essence, a bug out bag is a stash of supplies, easily transportable, that provides you with enough food and equipment to get you from Point A to Point B, on foot or otherwise. This emergency kit should be kept close at hand. If at all possible, keep one kit at work and one in your vehicle. This way, should you be forced to evacuate your workplace and are unable to get to where you’ve stashed your BOB, you still have the one in your vehicle to use if needed. At home, you should have a separate evacuation kit. Similar to the BOB, this kit will also include important documents, possibly treasured photos, and a few other critical odds and ends. This will supplement what you already have in your BOB in your vehicle should you need to evacuate your home in an emergency. Finally, you have the home emergency kit. This isn’t necessarily a box or bag of emergency specific items. Rather, your extensive and long-term emergency supplies might be kept throughout your home. In a pinch, your BOB and your home evacuation kit will augment what you have on hand at home. The whole idea is to have backups for your backups. Any one kit should be enough to see you to safety but when they are combined, the sum is greater than the parts. This is different from your bug out bag. While some components might be the same, the purpose is different. A bug out bag is designed to get you from Point A to Point B whether you’re on foot or in a vehicle. A vehicle emergency kit is to help you either get back on the road or keep you safe until help arrives if you’re stranded. It will be heavier and bulkier than your bug out bag and thus isn’t really designed for transport on foot. While you might not know much about vehicle repair, you’d be wise to keep a small set of tools and related gear in your trunk. A Good Samaritan might be willing to assist you but if he or she doesn’t have tools on hand, there isn’t much they’ll be able to do for you. The above should be enough to cover most basic emergency repairs to your vehicle. In addition to the tool kit, you should have a blanket, season appropriate extra clothing, water (separate from the gallon devoted to your tool kit), and a couple days of food. For the food component, be sure to select items that won’t go bad quickly in temperature extremes and won’t need to be prepared in any way. Crackers, granola bars, hard candy, that sort of thing. If at all possible, have a cell phone on hand as well. Make sure you have a car charger for it and keep the phone charged at all times. If nothing else, buy a cheap prepaid cell phone to keep in the car. Just be sure to stay on top of any renewals so you are able to use the phone if you need to. There are a variety of scenarios that might result in the loss of running water in your home. A power outage might take out your well pump. There might be an accident in your city that causes the city’s pump stations to go offline. Whatever the reason, there are several sources of water already in your home, if you just know where to look. Obviously, you should already have some water stockpiled. The following are merely methods to augment what you have on hand. Under no circumstances should you rely solely upon these methods and forgo storing water separately. As soon as you realize the emergency is affecting your water supply, cease using your toilet(s). Assuming you’ve not added any chemical disinfectants to your toilet tank, that water can be purified and used for cleaning. It could probably be consumed after purification but personally I’d have to be pretty desperate to resort to that just because of the ick factor. First, remember there is already water in your pipes. Fill your bathtub using the cold faucet only. Open all your sink taps and do the same, using clean containers for the water. If you have any reason to believe the water source has been contaminated in some way, purify it before cooking with it or drinking. Your water heater holds many gallons of water. There should be a small valve toward the bottom of the heater you can open to drain the water. However, unless you have enough containers to store it all, I’d recommend you leave it in the heater and just drain it as you need it. If you don’t already have and use rain barrels, consider purchasing a couple now and setting them up. You might be shocked to learn how much water will accumulate in just one rain shower. Just a fifteen minute rain shower will likely fill two 55 gallon rain barrels. Given the amount of bird dropping, bits of asphalt, and other detritus that is on a common roof, you’ll not want to drink the water in the barrels without purifying it first. The general rule of thumb is to have available in an emergency one gallon of water per person, per day. That is quite minimal and you should shoot for two gallons instead of one. Assuming you have an average size water heater of 30 gallons, add that to at least one 55 gallon rain barrel and you can easily have over eighty gallons of water available to add to your stored bottles. That’s enough to last two months for a family of four. Today is Thanksgiving Day here in the US. A day we set aside to give thanks for all we have. A day to spend time with family and friends. A day to gorge ourselves on great food and fall asleep watching football. As you do so, please take a moment to think of our fighting men and women in the military stationed around the globe. They are working hard each and every day, keeping us safe from threats abroad. They are thinking of us, wishing they were home to enjoy turkey and all the trimmings, surrounded by their own loved ones. Say a prayer for their safe return home. Posted on November 25, 2010 Author Jim CobbCategories Everything SurvivalLeave a comment on Happy Thanksgiving! It is 5:00AM and there’s pounding at your front door. Looking through the window, you see a squad car in the driveway. The Sheriff’s Deputy at your door tells you there has been a train derailment in the area and you need to evacuate immediately. He says you have ten minutes to grab whatever you need and be out the door. He’s not telling you what was on that train, only that there is immediate danger and it might be a fair amount of time before it is safe. The road to the north is the only route available to take when you leave, all other roads are blocked until further notice. What do you grab? Can you grab all that in less than ten minutes? Where do you go? How do you get there? If you’ve not done so recently, consider doing a “dry run” for a home evacuation. You might be surprised how long it really takes to get your stuff and head out the door. If you have children, obviously any emergency preparations you make must include them in the mix. Whether it is putting together a home evacuation kit or preparing for a possible total societal collapse, you have to factor in the needs of the littlest members of your clan. Here are a few things to keep in mind. In an emergency situation, you are likely to be a little freaked out. No matter what is going on, seeing a parent stressed out, frightened, or upset increases the stress to the child enormously. Kids seem to have an almost supernatural gift for sensing a parent’s dismay. No matter how well you try to hide it, your child will know something is up. Like everyone else, kids fear the unknown. As best you can, explain to your children what is going on and, perhaps just as important, explain what YOU are going to do about it. If you have planned in advance for emergencies, you’ll not only feel more comfortable when the inevitable happens but you’ll be in a better position to calm your children. In all bug out kits and evacuation supplies, be sure to include a few “comfort” things for your kids. A small toy or stuffed animal can mean the world to your child. It will give them something to hold, to occupy their time, and perhaps just be a little bit of “home away from home.” For older children, a book to read can be a godsend. A small notebook with a few pens will allow them to draw or write. Doing so will give them a possible outlet for their thoughts and worries as well as just giving them something to do while you figure out the next move. Comfort foods are another way to help reduce you and your child’s stress. 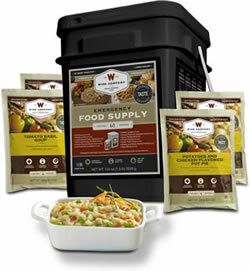 In your pantry, keep a small box of this type of food to break out during an emergency. Consider including things like hard candy, chocolate, bagged popcorn, or chips. You know, the fun stuff that’s no good for you, has no nutritional value, but damn if it ain’t tasty. Greetings and welcome to our new blog. Here, we shall be discussing anything and everything related to survival and emergency preparedness. I am your host and blogger, Jim Cobb. I thought for my first post here, I might take the opportunity to tell you a bit about myself. I’ve been studying this sort of thing for well over twenty years. I grew up in the upper Midwest, where we experienced a wide range of weather extremes every year. I can recall being perhaps five or six years old and hearing a tornado warning on TV. I grabbed what I felt were emergency essentials and headed to the basement. Being all of five years old, those supplies consisted of my teddy bear, blanket, a few random canned goods, and a flashlight. I continued to go through this same routine every time I heard a weather warning. It drove my folks crazy but by God I was going to save us all! Or at least that’s how it played out in my head. As I got older, I discovered post-apocalyptic fiction. The first book in this genre I read was Empty World by John Christopher. The book is about a young teenage boy in the UK who survives a global pandemic. The whole premise just grabbed me and wouldn’t let go. As a young boy myself, I could easily imagine the fun I could have without parents or teachers, rules or regulations, and no need to pay for anything I wanted! That one book began a lifelong infatuation with post-apocalyptic stories. It wasn’t too much later that I came upon Life After Doomsday by Dr. Bruce Clayton in a bookstore. I saved my allowance for a few weeks, then went back and bought it. I was probably the only kid in sixth grade who knew about the dangers of fallout, the importance of stockpiling food, and what weapons were best for a home armory. Yes, I was kind of a weird child. Today, I’m married to a very talented, intelligent, beautiful woman who shares my concerns about being prepared for the unknown. We’re accompanied on our journey by our three adolescent weapons of mass destruction. Despite all the studying and practicing I’ve done, I’m still learning. I don’t have all the answers. No one does. But, I’m hoping to share some of what I’ve learned with y’all through this blog. Further, I’m hoping you might share your own knowledge and perspective with me via the comments here. While I have a fairly lengthy laundry list of topics to discuss here in the near future, I’ll always welcome your questions and input. If there is anything you’d like to see covered in this blog, please don’t hesitate to comment below or shoot me an email. Posted on November 19, 2010 Author Jim CobbCategories Everything SurvivalLeave a comment on Welcome!